Our commitment in delivering the most recent and updated technology has been there since forever. In part of it, we are now making a break through initiative by conducting Webinar Series for our customers in order to share the latest Design & Engineering technology from Autodesk as our technology provider. This Webinar will covers detail technical features of each software and some of real life cases and best practices. 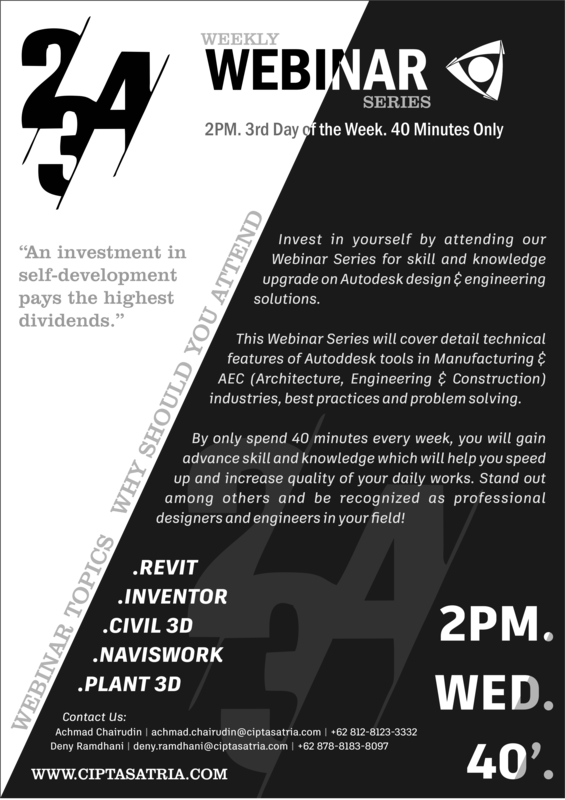 We strongly suggest for every Designers and Engineers who work in the industry and willing to upgrade their skills and knowledge to become professional in their field to follow our Webinar Series, for it doesn’t only will benefited to your company, but will also makes you stand out among your colleagues. You can have a full schedule of our Webinar Series after you register and fill up all the required information in the form, and soon after you will receive a Confirmation Letter from our team containing Webinar schedules for all topics and the link to the Webinar. Register NOW! by filling the form below and become one of those Pro! © 2004 - 2019. PT. Cipta Satria Informatika.